Premise- The show starts with six contestants competing in this game of memory and recall. In the first round, the contestants will be shown six video puzzles and the contestants will be asked questions about the videos which require a numerical answer. The five questions asked in this round are worth 10, 20, 30, 50, and 100 points respectively. The four players with the highest scores will advance to the second round, while the other two players go down “The Brain Drain”, a foam-filled slide formed as a human ear which leads to the stage exit. The second round is played with the remaining four contestants standing in front of a movable chair while listening to a story from “Jeff’s Big Book of Truth”. After the host has read the story, he asks the contestants questions pertaining to the story. After a contestant answers a question, they have to take a seat in the chair. If a “ding” sound effect is heard upon taking a seat, that means they have given a correct answer and they can stand back up and continue playing the game. However, if they give an incorrect response when sitting down, a “whoopee cushion” sound is heard and the contestant is eliminated from the game by being literally pulled off the set by staying seated in the moving chair. The host continues asking questions until two contestants remain. The two remaining contestants will compete in a “Knockout Round”. In the Knockout Round, the contestants will be shown a 4×4 board, which consists of eight pairs of images shown from the story, for ten seconds before the images are concealed behind the numbers 1-16. This round would continue as long as the contestants kept choosing matching images. Choosing two images that did not match sent the game into a “sudden death” situation. At this point, the first contestant to make the next correct match won the game and their opponent was pulled off the set and sent down The Brain Drain, along with the other eliminated contestants. In the bonus round (called “The Final Stage”), the winning contestant has 90 seconds to successfully navigate their way through the 4×4, 5×5, and 6×6 grids by memorizing the pattern on each grid. The 4×4 grid pathway is usually made up of a combination of six squares, the 5×5 pathway is made up of a combination of eight squares, and the intimidating 6×6 pathway is made up of a combination of ten squares. The contestant is shown the pattern twice before beginning each new grid and the clock starts when the contestant steps on the first square. The clock doesn’t stop until the contestant has correctly walked the pathway and hit the button at the end of the grid. Completing each grid won the contestant a prize and completing all three grids before time runs out won them both prizes, the grand prize trip, and they will get slimed “from head to toe” (as host Jeff Stuphen might say). If the contestants fails to complete all three grids before time runs out, they will get sent down The Brain Drain, but gets to keep all the prizes they have won. Before I begin my review, I’m glad to see the return of kids game shows on Nickelodeon, and even on Cartoon Network and The Hub. There may not be a lot them out there in this era of kids television programming, but I’m glad to see the few that are coming out with new episodes and seasons today. The moment after I watched the first few episodes of BrainSurge, I was immediately impressed with the show’s set, game play, and how they kept true to the style of Nickelodeon game shows. The show’s game play is challenging, testing the contestant’s memory and skills. 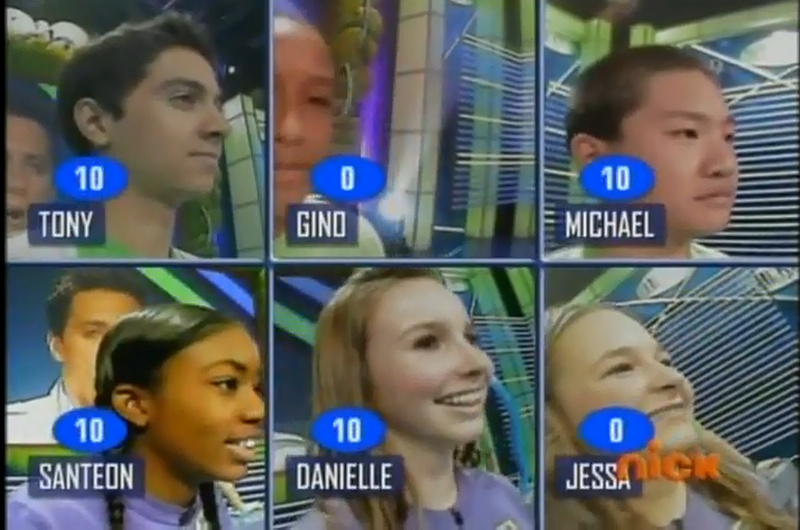 The game play also reminds me of Nickelodeon’s early 90’s game show Get The Picture, in terms of the mental skill level needed to be successful on the show. I also detected a hint of Double Dare in this show because of the fact that the contestants won’t leave the show without getting slimed or “gaked”, whether they’re going down The Brain Drain or getting slimed at the end of the show. On a quick side note, I’ve noticed that Nickelodeon game shows last for about three seasons or less. The reason I brought this up is because BrainSurge will be headed into their third season coming this fall under a new Family BrainSurge format. My concern is that BrainSurge might get pulled off the schedule after this upcoming season, especially with the change. Switching back to my review now, there are other elements that like in the show such as the “yanking” of the contestants off-stage (similar to contestants being pulled “off the air” on MTV’s Remote Control), the “Big Book of Truth” as one of the staples on the show, and even the challenging, often mind-bending bonus game. Additionally, Jeff Stuphen is a great host for this show, as he has the perfect amount of energy for a show like this. He gets along great with the kids on the show and keeps them entertained as well as the studio audience and the home viewers as well. The episodes are very fun and entertaining to watch, watching the tense competition between the kids playing on the show. I even found myself on the edge of my seat (sometimes screaming at the TV) watching some of the bonus rounds because of how close some of the contestants are from winning the grand prize, and sometimes fall short. The only problem I have with this show is the arrangement of prizes in the bonus round. I noticed that the 4×4 grid prizes are usually worth more than the 5×5 grid prizes. For instance, a 4×4 grid prize might be a drum set and a 5×5 grid prize might be a camera, and of course the 6×6 grid prize was the grand prize. It was a small observation, but it caught my attention nonetheless. Overall, this is a great show to watch and challenging to play, even at home when you’re watching the show. As I have mentioned before, the show will be coming back for a third season in Summer 2011 with Family BrainSurge episodes. I’m glad the show is coming back with new episodes and I hope to see even more of BrainSurge in the future. Watch BrainSurge Weeknights at 7:00pm EST on Nickelodeon!